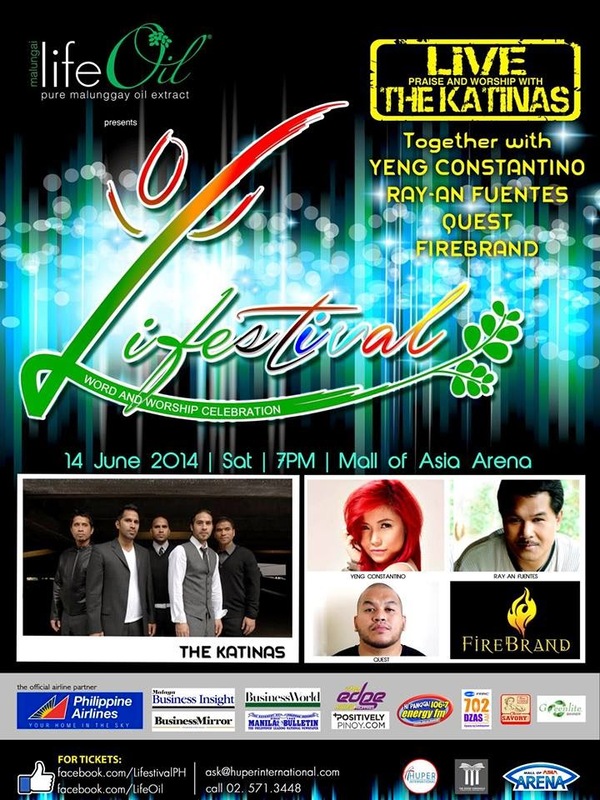 In celebration of its fifth anniversary, Life Oil® is holding LIFESTIVAL on June 14, 2014, Saturday, 7PM, at the Mall of Asia Arena. LIFESTIVAL WORD AND WORSHIP CELEBRATION event is a free thanksgiving offering in which local musicians and artists join together in a rare opportunity to lead in worship celebration, namely: (1) Dove Awardee and international contemporary Christian group The Katinas, (2) Philippines’ pop rock princess Yeng Constantino, (3) singer-turned-minister Ray An Fuentes (4) hip-hop and R&B singer Quest, and (5) new praise and worship team Firebrand. Let us glorify JESUS together! If you want to join in this assembly, like the official Facebook page of Lifestival at https://www.facebook.com/LifestivalPH and send a private message that includes your complete name, address, mobile number, and the message "LIFE IS GOOD! I WANT A FREE TICKET TO LIFESTIVAL WORD AND WORSHIP CELEBRATION!" A confirmation message will later be sent individually to all those who will qualify for free tickets, with details on how to claim their free tickets. LIFESTIVAL Word and Worship Celebration is also supported by the Philippine Airlines, Malaya Business Insight, BusinessWorld, Business Mirror, Manila Bulletin, The Edge Radio, positivelypinoy.com, 106.7 Energy FM, 702 DZAS, Savory Chicken, and Greenlite Banner. Lifestival is a special event managed and staged by Huper International events and productions specialist. Lifestival is presented by Life Oil® 100% pure malunggay oil extract, the only oil-based moringa product in the market today. This all-natural nutriceutical food supplement is rich in Organic Live Chlorophyll, Essential Amino Acids, Vitamins, Minerals, and Phytochemicals. Since complete nutrients should come naturally, a single Life Oil® 500ml soft-gel is equivalent to half a kilo of fresh malunggay leaves – great for increased energy, strengthened immune system, lowered cholesterol, managed sugar levels and blood pressure, even moisturized skin. Feel good with Life Oil®today. Life Oil®is available in leading drugstores nationwide.